Councilor Susan Joe Rembert-Parks, District Two, is the representative for the oldest district in the city of Fairfield. Renowned for the historical attributes displayed in the architecture of the homes and landmarks throughout the area. District Two is adjacent to the birthplace of the Steel Industry, a catalyst for Theodore Roosevelt’s New Deal. US Steel was once considered the driving force for the “Older City Moving in a New Direction.” The older city known as Corey, Alabama, was established in 1910, long before the installment of municipal districts. It was centralized in what is now District Two. Corey, Alabama expanded and was later renamed Fairfield in 1919. Located in this district, there is Fairfield City Park, the Downtown Business Sector and the city’s main thoroughfares: Lloyd Noland Parkway, Gary Avenue and Valley Road. Commerce Avenue, 57th Street, Donald Parkway, Crawford Street and the streets between are also points of interest for Councilor Parks. Councilor Parks is the Chair or Health, Education, Welfare and Human Resources Committee where her responsibilities include making recommendations regarding issues relating to public health and wellness, education, charitable causes, housing, parks and recreation, work relief and employment issues. The Health, Education, Welfare and Human Resources Committee conducts research and assessments in reference to the above listed matters. This committee’s primary function is to identify resources that may benefit the general public to include but not limited to residents, city employees and appointments, officers and other personnel, consumers, partakers of the educational system, merchants and business owners. Councilor Parks also serves on the Telecommunications Committee and the Planning & Zoning Committee. 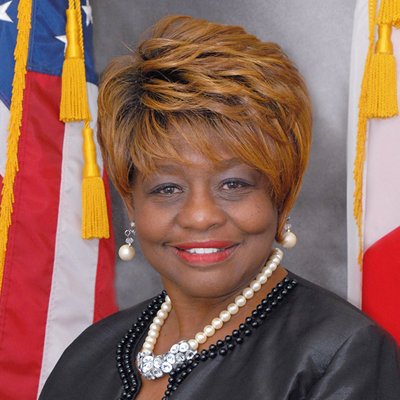 Councilor Parks is a product of Alabama A&M University where she obtained a Bachelor’s Degree in Mental Health Studies. She is embarking upon her 42nd year in education as a Guidance Counselor. Councilor Parks is a member of the National Education Association, the Council of Exceptional Children and the National Association for Guidance and Counseling. Councilor Parks is family oriented with Christian values, dedicated, multi task driven, and methodical. She is a team player, a woman of integrity and confidence who is motivated, conscientious and focused on the needs of others. Councilor Parks is a fourth generation resident and she continues to work hard to restore a sense of pride in the city of Fairfield. Perseverance is a strength of hers which she uses to be an inspiration for aspiring leaders in her career as an educator and with her political influence.